It's a spectacle that won't repeat for another century — the sight of Venus slowly inching across the face of the sun. On June 5, Venus will cross the face of the sun. If you live in North America, Europe, Asia or eastern Africa, you'll be able to witness this historic celestial event, which won't happen again for more than a century. 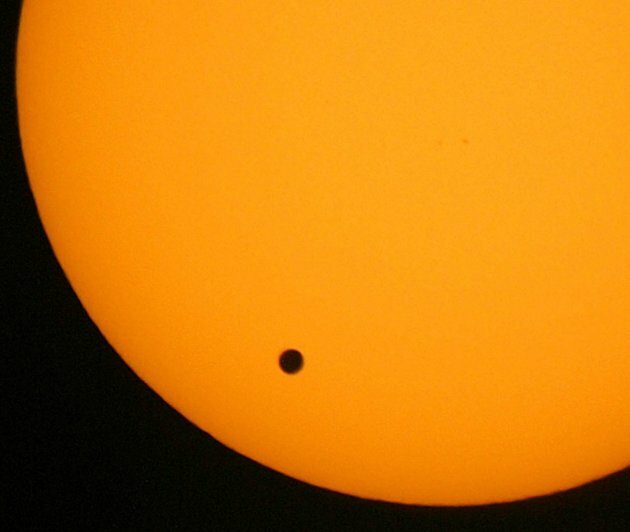 But considering how dangerous it is to look at the sun directly, how can you view the so-called "transit of Venus" without having to go out and buy any fancy equipment or filters? All you need are a few household items: binoculars, a tripod (or some other prop), duct tape, scissors or a box cutter, and two pieces of cardboard. Let us be clear: Do not look directly at the sun through the binoculars — this would be extremely dangerous, and would probably severely burn your retinas. Instead, you can use the binoculars to project an image of the sun. Step 1. Trace around your binoculars' large lenses on a piece of cardboard. Cut out the circles and set the cardboard aside. Step 2. Attach your binoculars to a tripod with duct tape, or stack some heavy books near the edge of a table and lean the binoculars against them. Step 3. Angle the binoculars so that the large lenses point toward the sun. Move them around until their shadow is on the ground, wall, or any other flat surface is as small as possible. The smaller the shadow, the more directly aligned they are to the sun. Step 4.Fit your cardboard cutout around the binoculars' lenses to give yourself a nice shadowed observing area. Cover one lens. Step 5. Hold up a piece of cardboard about a foot behind the binoculars; you'll be able to see an image of the sun. Focus the binoculars until the sun's edge sharpens, and you should be able to see dark blotches on its surface called sunspots. During the transit of Venus — which will proceed from 3 p.m. to 10 p.m. Pacific time — you'llsee the tiny bead of the planet slowly cross the bright solar sphere. Two more safety tips: Don't leave the binoculars focused on the sun for more than a few minutes at a time, because the eyepiece can become overheated. And don't leave your projector setup unattended; the beam could ignite the cardboard target, or someone could come along and be burned by the beam.